Television is called an idiot box because of the dampening and addictive influence it has on viewers. When asked about television, Groucho Marx, the famous American comedian and film star, had this to say about it: “I find television very educating. Every time somebody turns on the set, I go into the other room and read a book”. Evidently, Marx wasn’t exactly full of praise for what is hailed as one of the greatest inventions of the twentieth century. Interestingly, Marx was a famous television personality himself, which makes it all the more difficult to consider his understanding of the television. However, what’s even more difficult to believe is that just within the first century of its invention, the TV has already been branded as an “idiot box”. There are always two sides to a coin, but in case of the television, its ‘other’, i.e. the disadvantageous side is rarely presented. When the television was invented, it was done so with the purpose of emanating information and educating people. In its early years, the television successfully did so. A few more years down the line, the television found another spectrum of diffusing audio and video content, which was that of entertainment. This made the TV what it is today. Television sets appeared to spring up in every locality, household and currently every room! Clearly, people were entertained like never before and that is why they worshipped and deified television in a way, but the other side of the coin, that is the TV’s educative and informative responsibilities suddenly went out the window. And as Bard would tell us: “Herein lies the rub”. The prime reason for TV being an idiot box, is not the television itself, but its content. Almost everyone watches TV these days; even little babies and toddlers can’t do without their regular dose of cartoons. Content which is aimed at making people smart and educated is a rarity on most television shows. Instead, television has brought human intelligence to its knees with the kind of nourishment that it provides to our brains. Naturally, any person that spends most of his time viewing such thick content, can’t expect his aptitude to improve by watching TV. In fact, a person wanting to improve his intelligence quotient is better off not watching such content at all. With a manifold increase in entertaining content on television, more and more people got glued to it. The 90’s saw a revolution in the way TV was watched, with many different channels aimed at catering to people of diverse tastes and interests began to be launched serially, year after year. By now, we have a plethora of channels on TV which we can spend almost an entire day on, just by flipping through them! The quality of television viewing has improved too. Big screens with crystal clear images have found their way into a typical TV viewing family’s living room as one of their most prized possessions. However, the quality of content being shown on the television has got to catch up with its rapidly improving technology. If it were to happen, the exact opposite of this fact would be an ideal situation to be in. 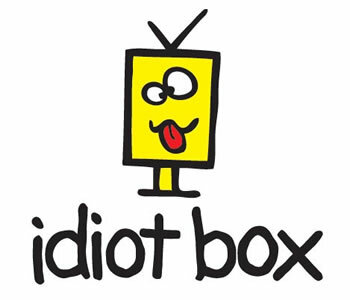 As much as TV is known as an idiot box, it is also increasingly becoming an ‘idiot’s box’. Parents of the present generation are greatly worried by the fact that their kids have become almost addicted to television. Some parents are inconsolably worried as they’ve got addicted to TV themselves. This could lead to many problems in a family, especially in a child’s life. There’s a beautiful story worth citing here in relation of this topic. The story goes that in a school, a teacher asks all her students to write an essay on what they would like God to do for them. Among many funny, fascinating and thought provoking essays, there was one which got the teacher teary-eyed. The essay was very simple and very short, but the message was incredibly deep. The essay read that “Dear God, my only wish to you is to make me into a TV. I want you to do so because by being a TV I can finally get the attention of everyone in my family, I can feel important, and no longer feel lost and neglected. I would be regularly viewed and interacted with, which would make me really happy, and most of all, my family members would then spend most of their time with me”. The little essay sums it all really. It’s obvious enough that excess of television viewing is eating into our daily lives, disrupting our social influence, making us dense, affecting our health and most of all, as the little kid put beautifully, it’s distancing us from our near and dear ones. So, whenever you think of it, it’s always the right time to unsubscribe from a few television channels and check those hours spent before the idiot box screen, because as it’s said: “If you read many books, you are a good reader, but if you watch too much TV, then you’re probably not a good viewer”.